The supporting structures of your teeth are known as the periodontium, which includes the bone and the tissues surrounding your teeth (i.e. your gums). They play a critical role, providing stability for your smile, and the best way to ensure continued good periodontal health is to diligently brush and floss your teeth as part of your daily hygiene routine. In addition, regular dental visits that are tailored to your periodontal needs are invaluable in preserving your overall oral health. Why Choose Torrington Dental Care for Help with Gum Care? Bacteria that are normally present in every mouth can, if left undisturbed, colonize on tooth surfaces, resulting in the formation of plaque (soft deposits) and calculus or tartar (hard deposits). 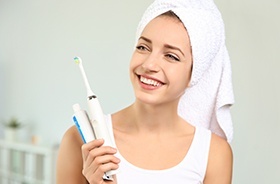 The goals of routine dental hygiene visits here at Torrington Dental Care is to eliminate the hard deposits that you cannot remove on your own, identify areas of concern regarding your teeth and gums, and help you develop the proper techniques that will work to keep your mouth as healthy as possible. To learn more about how to take care of your gums at home, or to schedule your next dental hygiene visit, contact us today.